The HISTORY pane, with real examples of prints on a Rostock MAX V2. The HISTORY pane displays a log of print sessions the printer has attempted and completed. The number of prints completed by MatterControl since the program was installed, the print history was cleared, or the database was cleared. The amount of time the printer has been actively printing since the program was installed, the print history was cleared, or the database was cleared. 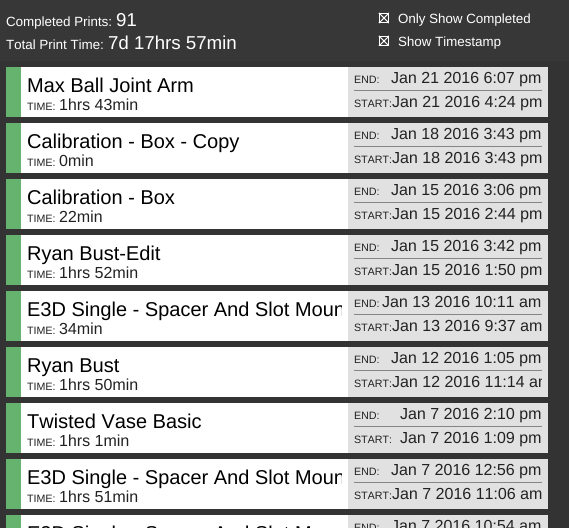 Toggles the display of only completed print sessions. Cancelled or otherwise failed sessions are not shown. Toggles the display of start and end times in the log. 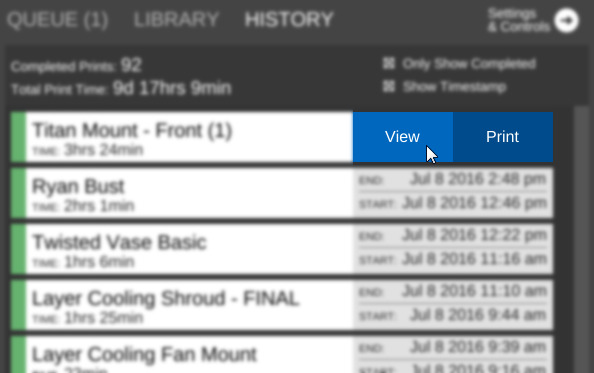 To clear the log, navigate to the Options menu and use the button in the Clear Print History section. Clicking the View button next to a past print will open the generated G-Code file in a new 3D VIEW window. Clicking the Print button next to a past print will send the G-Code to the printer and start the print. This page was last modified on 1 December 2016, at 11:53.